A free weekend. No social commitments. What a rare (and exciting) occasion! When presented with one of these weekends, the answer is always simple. Robbie and I pack the car and head to Dromana on Victoria’s lovely Mornington Peninsula. As the sun was beginning to shine through the fog and as the morning chill began to dissipate, we emerged from the warmth of our cosy beach home. With our esky packed and picnic supplies in tow, it was time to hit the road. Our first stop after breakfast is always coffee. It goes without saying, an unspoken morning ritual, like brushing our teeth, we just do it. 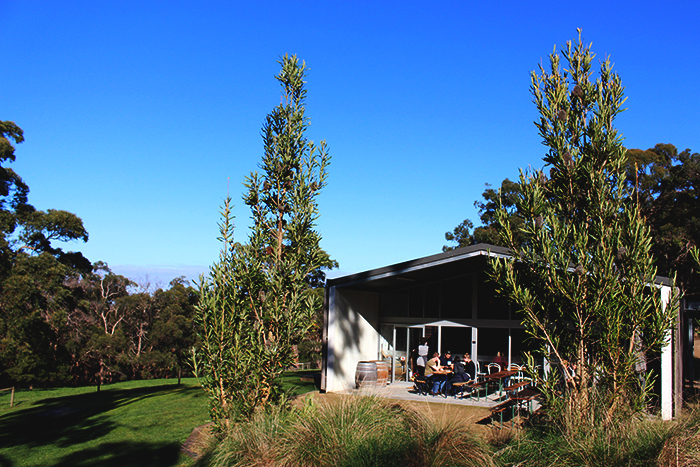 As we cruised toward Red Hill we decided it was only right to stop in at Mornington Peninsula Cellar & Pantry, one of our favourite coffee spots along the Peninsula. Cellar & Pantry is a specialty grocer, focusing on local food and wine, with a great little café out front. We perched ourselves on the front deck just outside the café, taking in the fresh air and drinking in the warmth of our freshly brewed coffees. With our coffees and crossword complete, we were ready for the day to officially begin. We jumped back in the car and drove the 8 minutes to Main Ridge Dairy Farm. It was time for cheese – farm fresh goats cheese (naturally lower in lactose)! Main Ridge Dairy truly is a beauty. 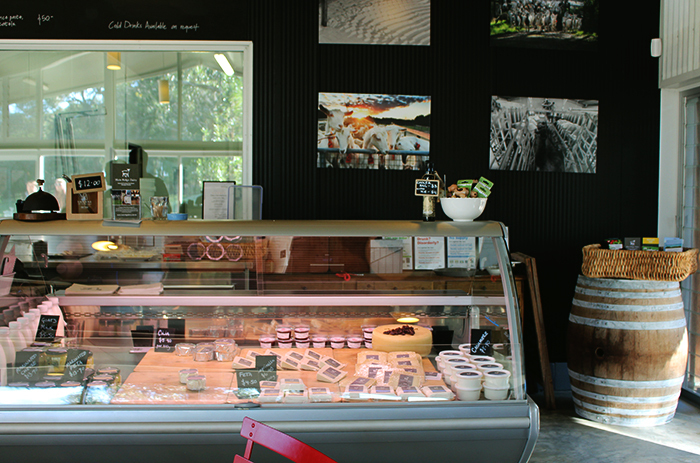 With a cheesery cafe set on the farm, you can order tasting plates with all their different goats cheeses on offer. 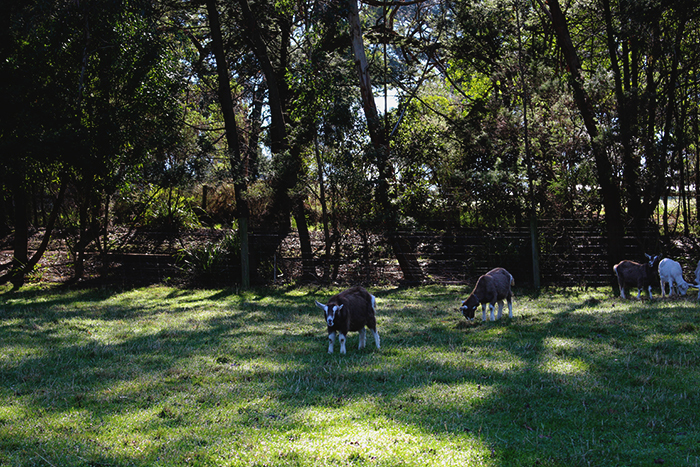 The cafe has ample space to sit and enjoy your tasting plate along with a coffee or glass of wine, but we like to bring along our picnic rug and set up on the lawn, looking out upon the green farmland and the kids and goats roaming about. 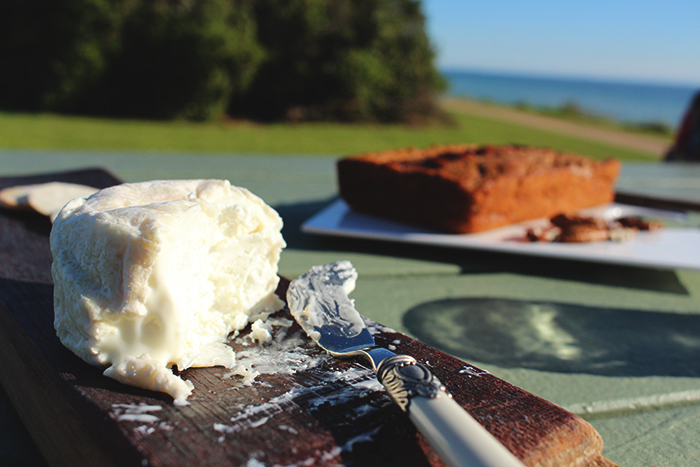 This particular day we had a different picnic site in mind so we bought our cheese to takeaway instead – one of the last of their seasonal cheeses, Capricious, a briefly matured fresh goats cheese. Perfection. 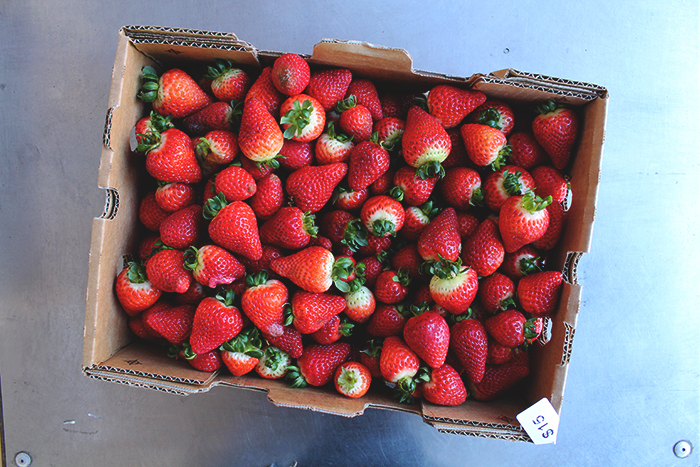 Our next stop was Sunny Ridge Strawberry Farm a mere 3 minutes around the corner. In the warmer months, this spot overflows with people keen to get their strawberry fix. I don’t blame them one bit. 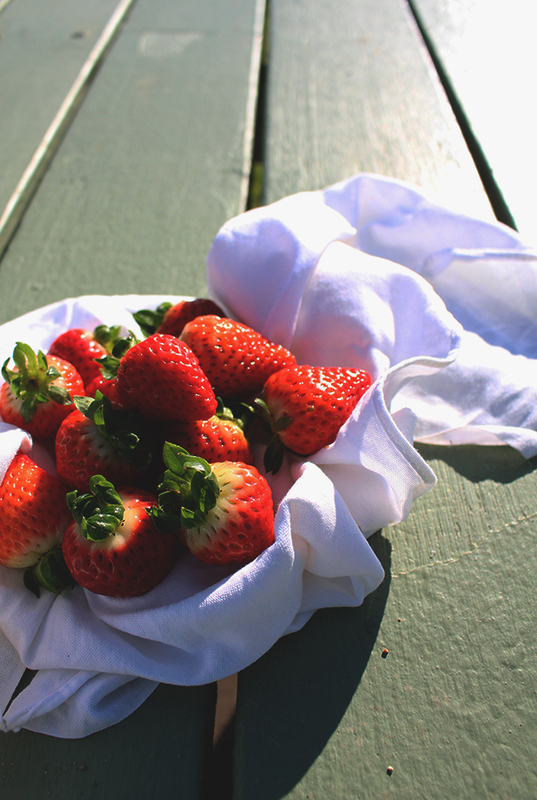 The cafe is full of decadent strawberry desserts and fresh berry ice creams, and from November to April you can forage in the farm and pick your own strawberries. It’s so awesome! 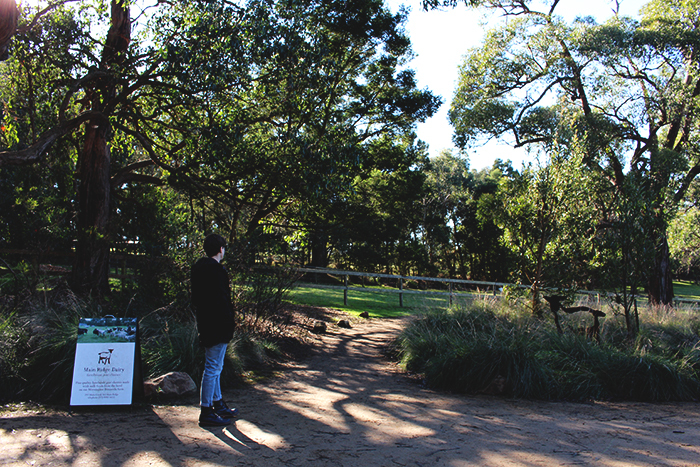 Our winter visit was just as awesome, only there was no crowd (yay) but with that (sadly) no strawberry pickings. 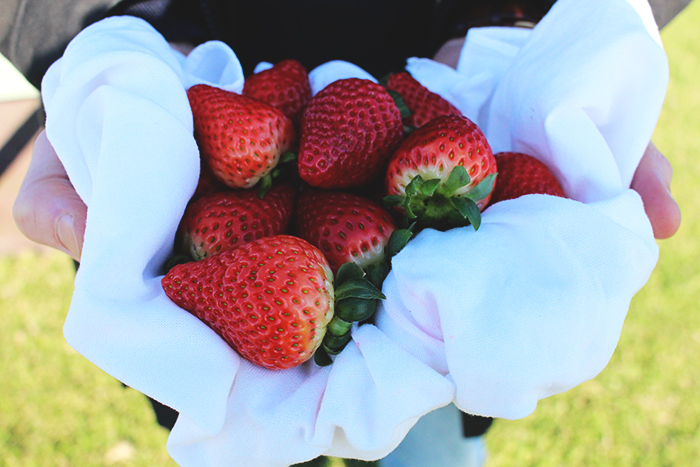 One thing had not changed between summer and winter though – the strawberries were still sweet and delicious! We grabbed a punnet and were on our way again, our picnic looking very promising. For the perfect picnic spot, we decided on the Safety Beach foreshore – plenty of green grass, picnic benches and a pretty view overlooking the ocean. From September to May you’ll find the funky Cafe Del Sol coffee van in this exact spot, but seeing as it was chilly winter, it was lucky we knew to come prepared. The night before our picnic, we baked a Chai Spiced Pumpkin Bread for the occasion, and brewed some extra chai tea to accompany. 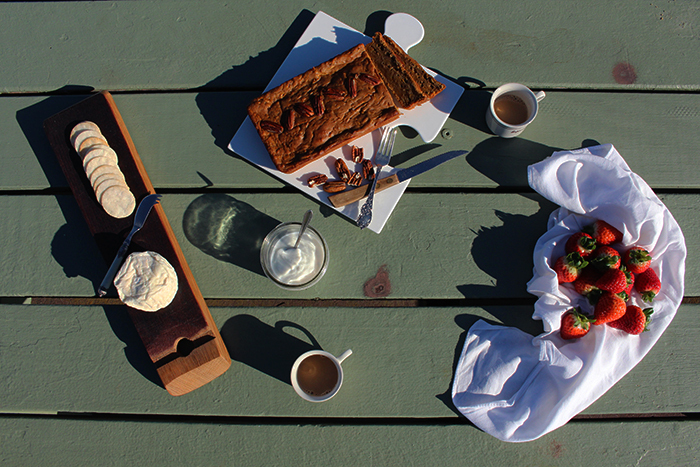 Chai Spiced Pumpkin Bread, Capricious goats cheese and a punnet of fresh strawberries – totally set! And, of course, it couldn’t be a FLK post without a friendly recipe! I hope you enjoy this Chai Spiced Pumpkin Bread as much as we did. The perfect picnic accompaniment. Preheat oven to 160 C and grease a loaf tin. Brew chai tea according to instructions to make half a cup once strained, and set aside to cool. Mix together egg, oil, maple syrup and vanilla. Add pumpkin and brewed chai. In a separate bowl combine flour, baking powder, baking soda and cinnamon. Add the wet mixture, and mix well. Pour into loaf tin, garnish with pecans and a sprinkle of cinnamon. Bake for approximately 1 hour, until cooked through. Remove from oven and allow to cool for 15 minutes before removing from the tin. What a pretty hotspot! I would love to try the spelt chai pumpkin bread!